The Virgin Galactic RocketMotorTwo that powered SpaceShipTwo on its Dec. 13, 2018, first flight into space has been donated to the National Air and Space Museum. A rocket motor that powered a commercial passenger ship on its first flight into space will next be used to ignite public interest in the future of spaceflight as an artifact in the Smithsonian's collection. The National Air and Space Museum on Thursday (Feb. 7) received the donation of RocketMotorTwo, the engine that flew on Virgin Galactic's SpaceShipTwo "VSS Unity" into space on Dec. 13, 2018. The motor will eventually be displayed in the "Future of Spaceflight," a new gallery at the Washington D.C. museum scheduled to debut in 2024 as part of a seven-year renovation now underway. Designed and built by The SpaceShip Company, Virgin Galactic's manufacturing sister company, RocketMotorTwo was confirmed by Guinness World Records as the "most powerful hybrid rocket to be used in manned flight." On the Dec. 13, 2018 flight, test pilots Mark "Forger" Stucky and Frederick "CJ" Sturckow fired the engine for 60 seconds, propelling SpaceShipTwo to an altitude of 51.4 miles (82.7 kilometers), qualifying the crew members for FAA Commercial Astronaut wings. 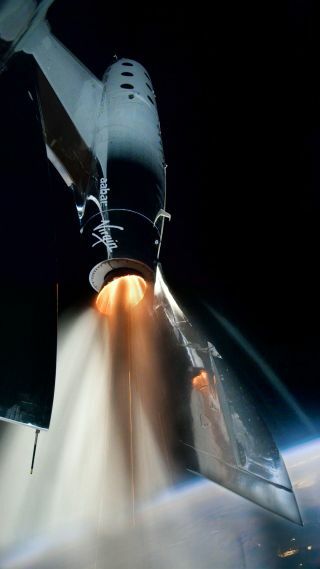 The donated rocket motor, or, more specifically, the Case-Throat-Nozzle assembly, is part of SpaceShipTwo's hybrid propulsion system — a design that combines the simplicity of a solid-fuel motor with the ability to control a liquid-propellant engine. RocketMotorTwo can be shut down quickly at any point during flight and has very few moving parts, resulting in what Virgin Galactic describes as a robust design for human spaceflight. "It does not just represent technical achievement," said Stofan about the hybrid engine's donation. "It is sure to also inspire our visitors by demonstrating what can be achieved through entrepreneurial innovation." Virgin Galactic founder Richard Branson joined Stofan and Enrico Palermo, the president of The Spaceship Company (TSC), to reveal the donation on Thursday. "We're proud to be making history as we work towards launching the world's first commercial space line, and today we could not be more delighted to donate a piece of that history to the Smithsonian's National Air and Space Museum for its wonderful new exhibition," Branson said in a statement. "The desire to explore space has been an inspiration since time began and, in recent decades, an incredible catalyst for innovation." "I hope our donation will also play a small part in inspiring the thousands of visitors as they pass through the new gallery in years to come," Branson said. Guinness World Records has certified Virgin Galactic’s RocketMotorTwo as the "most powerful hybrid rocket used in manned flight." RocketMotorTwo, which is approximately 15 feet (4.5 meters) long and weighs 1,500 lbs. (680 kilograms), will first go on display at the National Air and Space Museum's Steven F. Udvar-Hazy Center in Chantilly, Virginia, until such time the "Future of Spaceflight" gallery is ready. "This motor and its development process is a perfect example of what can be achieved when talented people come together to work on their dreams," Palermo said in the same statement. "TSC looks forward to building more rocket motors and the fleet of SpaceShipTwo's, watching them provide the power to open space and change the world for good." RocketMotorTwo is the second major artifact related to the development of SpaceShipTwo to enter the national collection. Since 2005, the National Air and Space Museum has exhibited SpaceShipOne, the Scaled Composites suborbital spacecraft that served as the design basis for Virgin Galactic's passenger craft. "To see this rocket go from concept, to production, through ground test, and finally into space, and then be accepted to the world's most respected aerospace museum is a well-deserved recognition for the spaceship propulsion team," said George Whitesides, the CEO of The Spaceship Company and Virgin Galactic. See more photos from the donation of Virgin Galactic's RocketMotorTwo at collectSPACE.